Reading and share top 13 famous quotes and sayings about Seen And Unseen by famous authors and people. 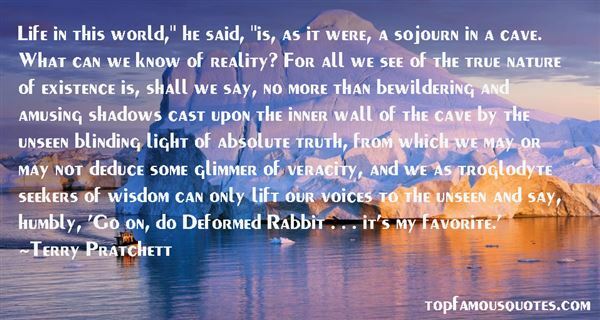 Browse top 13 famous quotes and sayings about Seen And Unseen by most favorite authors. 1. "Above all, there has never been a community that did not cohabit with its dead. But today, socially, the dead are no more. They are deceased. They are ontic has-beens. And with the vanishing of the dead, the most significant distinction between homo and all other primates is gone. When you show me a paleolithic skull, I recognize it as human not because of the cubic measure of the brain or because of the hand tools found in the grave but because of signs of burial. These reveal that this "person" lived a life on the borderline between the seen and the unseen, in the presence of the living and the dead. Neither the dead nor other invisible beings had to show themselves to be considered social realities." 2. "Freedom is a place, an area. It's a higher place. There are some other people that are here, and things that are here which are unseen. But you first have to set yourself free and believe in what you cannot see, believe that there is something more out there. In freedom can be found many devotions: a devotion to love, a desire to believe, a willingness to be happy, a perseverance to have peace. All these unseen things breathe and grow in the unseen soul. A free person is not an uncommitted person, but in a free person you will find a deep devotion, and a desire to be devoted to even more." 3. "Each one, in my impassioned interior conversations, granted me some aspect of my most dearly held, most fiercely hidden heart's desires. Life, art, motherhood. Love and the great seductive promise that I wasn't nothing. That I could be seen for my unvarnished self, and that this hidden self, this precious girl without a mask, unseen for decades, could, that indeed she must, leave a trace upon the world." 4. "Kuan Yin is showing me picture of a windsurfer skimming effortlessly along the ocean's surface," describes Ms. Lees. "While quite skilled, he is nevertheless very focused on the elements around him. The windsurfer is focused upon how to turn the sail. His question must always be, 'what am I going to do with the wind that is blowing right now,'" instructs Kuan Yin: "There are the waves and there is the wind, seen and unseen forces. Everyone has these same elements in their lives, the seen and unseen: karma and free will. The question is, ‘how are you going to handle what you have?' You are riding the karmic wave underneath and the wind can shift. Everyone must take what they see and deal with that which is unseen." 5. "On occasions, global or personal, we may feel we are distanced from God, shut out from heaven, lost, alone in dark and dreary places. Often enough that distress can be of our own making, but even then the Father of us all is watching and assisting. And always there are those angels who come and go all around us, seen and unseen, known and unknown, mortal and immortal." 6. "Let no one bewail his poverty,For the universal Kingdom has been revealed.Let no one weep for his iniquities,For pardon has shown forth from the grave.Let no one fear death,For the Saviour's death has set us free.He that was held prisoner of it has annihilated it.By descending into Hell, He made Hell captive.He embittered it when it tasted of His flesh.And Isaiah, foretelling this, did cry:Hell, said he, was embitteredWhen it encountered Thee in the lower regions.It was embittered, for it was abolished.It was embittered, for it was mocked.It was embittered, for it was slain.It was embittered, for it was overthrown.It was embittered, for it was fettered in chains.It took a body, and met God face to face.It took earth, and encountered Heaven.It took that which was seen, and fell upon the unseen.O Death, where is thy sting?O Hell, where is thy victory?" 7. "Church didn't answer that. Instead he said, "The darkness is all around us. Very few people have the courage to light a candle against it. ""I'm not that kind of idealist. ""Nor am I. 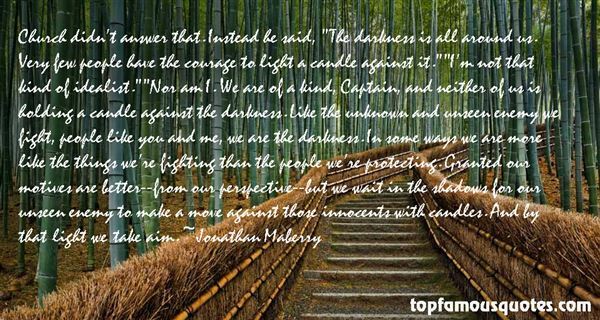 We are of a kind, Captain, and neither of us is holding a candle against the darkness. Like the unknown and unseen enemy we fight, people like you and me, we are the darkness. In some ways we are more like the things we're fighting than the people we're protecting. Granted our motives are better--from our perspective--but we wait in the shadows for our unseen enemy to make a move against those innocents with candles. And by that light we take aim." 8. "In both the presence of evil and the eventual triumph over evil the sweep is cosmic. It embraces the entire universe, what to man is both seen and unseen. The victory is to be accomplished through Christ." 9. "We human beings instinctively regard the seen world as the "real" world and the unseen world as the "unreal" world, but the Bible calls for almost the opposite." 10. "Tragedy's language stresses that whatever is within us is obscure, many faceted, impossible to see. Performance gave this question of what is within a physical force. The spectators were far away from the performers, on that hill above the theatre. At the centre of their vision was a small hut, into which they could not see. The physical action presented to their attention was violent but mostly unseen. They inferred it, as they inferred inner movement, from words spoken by figures whose entrances and exits into and out of the visible space patterned the play. They saw its results when that facade opened to reveal a dead body. This genre, with its dialectics of seen and unseen, inside and outside, exit and entrance, was a simultaneously internal and external, intellectual and somatic expression of contemporary questions about the inward sources of harm, knowledge, power, and darkness." 11. "The last at last seen of himhimself unseen by himand of himself"A rest.The last Mr. Murphy saw of Mr. Endon was Mr. Murphy unseen by Mr. Endon. This was also the last Murphy saw of Murphy. "A rest.The relation between Mr. Murphy and Mr. Endon could not have better summed up than by the former's sorrow at seeing himself in the latter's immunity from seeing anything but himself. "A long rest.Mr. Murphy is a speck in Mr. Endon's unseen." 12. "Poise is an unseen power,And this unseen power is always readyTo come to the aid of the outer action." 13. "Life in this world," he said, "is, as it were, a sojourn in a cave. What can we know of reality? For all we see of the true nature of existence is, shall we say, no more than bewildering and amusing shadows cast upon the inner wall of the cave by the unseen blinding light of absolute truth, from which we may or may not deduce some glimmer of veracity, and we as troglodyte seekers of wisdom can only lift our voices to the unseen and say, humbly, ‘Go on, do Deformed Rabbit . . . it's my favorite.'" I've always been someone who really watches other people, human behavior. To watch it and be able to express it through your version has always been really exciting to me."